Used extensively in high production facilities throughout the World, the 4000 Series is renowned for its outstanding performance and reliability. THE CONSTRUCTION of the 4000 Series is robust and built to last. Manufactured from HIGH QUALITY STAINLESS STEEL a strong structured framework supports a thick gauge mixing bowl and panels that are FULLY SEAM WELDED BOTH INSIDE AND OUTSIDE THE BOWL. 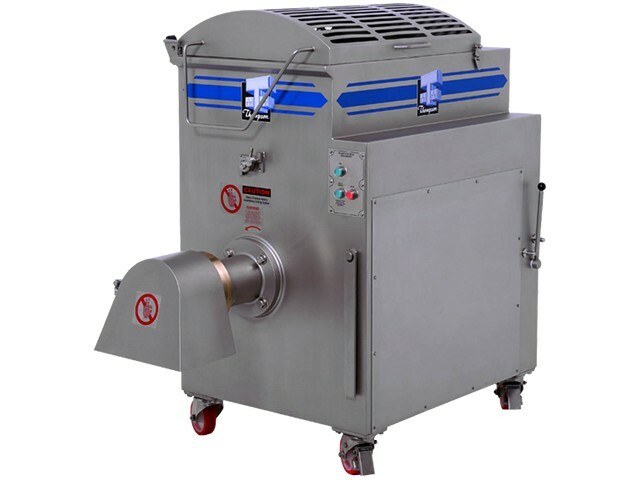 The standard height machines incorporate a HEAVY GAUGE DOMED LID with an open grilled section for ingredients adding or viewing of the mix cycle. An ingredients or liquids pouring channel is also offered as an option. The 4000 SERIES has been designed and developed to the high standards of safety and finish demanded by CE / USDA AND GS regulations. The MIXING PADDLE AND MINCE TRANSMISSION are powered with INDEPENDENT GEARED MOTOR DRIVES. No more oily greasy chains, no more continual maintenance of pulleys and belt drives. Smooth, compact and quiet the HEAVY DUTY DRIVES are very efficient in transmitting maximum power from LARGE HP MOTORS - featuring a STANDARD 2 SPEEDS on the feedscrew drive with HIGH TORQUE on low speed. Both feedscrew and mixing drives have been engineered and developed over many years of research optimising RPM’s and involving many varied processing applications. THE PERFORMANCE of the 4000 Series speaks for itself. Time and again sausage manufacturers have commented about the processing capabilities of the 4000 machines. SPECIFICALLY DESIGNED PADDLE BLADE ANGLES AND CONFIGURATIONS ("smart design") maximize the product displacement and movement within corresponding mixing bowls that have been specifically contoured to accentuate the mixing action. Sausage mix is quickly yet gently mixed and consistently amalgamated and separated. The 4000 mixing cycle is controlled by a factory "pre-set" or easily adjusted reciprocating mix cycle that achieves a well distributed particle mix for coarse ground high definition products or emulsified evenly seasoned products. The standard cutting head on the 4000 Series is "56" (152 mm or 6"). The optional cutting heads are "66" (220 mm or 8 5/8") or "GU" 160 double cut system. These cutting heads DELIVER HIGH PRODUCTION RATES to a variety of products from TEMPERED OR FLAKED FROZEN MEAT TO LIGHT FRESH MINCE. The mixing bowl and cutting head features all combine to offer a very HOMOGENEOUSLY MIXED PRODUCT with a high definition cut in short mix/mince cycles, therefore limiting heat rise to the product. SAFETY FEATURES on the 4000 Series are plentiful since the machine was also developed with safety as a premium concern, conforming to the high demands of local and overseas regulations. The safety interlocked lid is a standard feature on all machines incorporated with a maximum stop time on the machine cycle, limiting any possibility of human interference with rotating parts. A SAFETY INTERLOCKED DISCHARGE GUARD is also a standard feature. Standard height machines are designed for ergonomic low load heights. On the raised machines (built for 200 litre bin feed and discharge) THE OPTIONAL INSPECTION STEP AND PLATFORM are SAFETY INTERLOCKED and offered with the lid or no lid option including the INSPECTION MIRROR option. OPERATOR CONTROL of the 4000 Series machines is very straightforward and USER FRIENDLY. GEMINI SYSTEMS The connection of two machines to incorporate a CONTINUOUS MINCING SYSTEM OR PROCESS. Connecting a Primary Mixer Mincer for the first mince operation which then AUTOMATICALLY FEEDS THROUGH AN INTERCONNECTED TUBE to the Secondary Mixer Mincer for continuous processing of the second mince operation. Product transfer is achieved through a guarded interconnecting tube, by a safety interlocked transfer tube or a combination of both. The machines can also be easily separated in the event that different processing applications may be required i.e. batching of formulated product or emulsions. The Gemini system allows Thompson 4000 Series Mixer Mincers to be connected in tandem with multiple machines including non Thompson machines. THE ADVANTAGES FROM UTILISING GEMINI SYSTEMS for continuous mincing can include REDUCED CAPITAL EQUIPMENT COST from eliminating second mechanical loading hoist or device, LABOUR COST SAVINGS from improved operation efficiencies in production and IMPROVED PRODUCT QUALITY by eliminating product storage and processing time during the 1st and 2nd mincing operations. With the 66 Size head the OUTSTANDING PROCESSING PERFORMANCE and capabilities of the 4000 series machines are FURTHER IMPROVED. The flared head design and the 8 5/8" DIAMETER KNIVES AND PLATES of the 66 Size INCREASES PRODUCTION rates on fresh mince and sausage emulsions by as much as 20 % over the 56 Size head. Production rates and the DEFINITION OF CUT IS IMPROVED and the 66 head is RECOMMENDED as a very favorable OPTION to a STANDARD 4000 Series machine when higher demands of processing are required. THE 66 SIZE HEAD COMPLIMENTS THE POWERFUL MOTORS AND TOUGH DIRECT DRIVES OF THE 4000 SERIES OFFERING THE OPTION OF FURTHER GAINS IN MINCING CAPABILITIES. Increasing the head size to 66 (8 5/8") also assists in reducing cutting head pressures - reducing smearing possibilities and offering a very high definition of cut.